Following a slump in the U.S. stock market last week, share prices went for a roller-coaster ride today, with the Dow Jones industrial average plunging about 1,000 points in the morning before recovering somewhat in afternoon trading. The volatility of the market appears to be related to domestic and global economic concerns, experts said. The Dow had its worst day in four years last Friday, losing about 530 points, down 3.1 percent, to 16,460 at the close of trading in New York; and the S&P 500 fell about 64 points, or 3.2 percent. Both indices had their biggest percentage drops since November 2011. The NASDAQ composite dropped about 171 points, or 3.5 percent. Many U.S. companies and investors are worried about the second-biggest economy in the world, China, and how a slowdown there would affect their production and trade, according to experts. The Dow Jones industrial average and Standard and Poor's 500 index had their worst decline on Thursday since Feb. 3, 2014. 1. 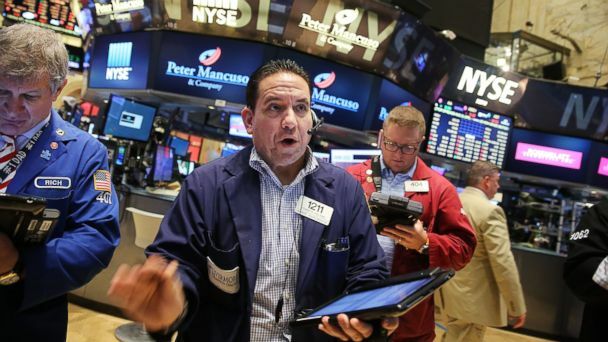 China Slowdown WorriesToday's global sell-off is an extension of investors' concerns from Thursday and Friday, Mark Zandi, chief economist with Moody's Analytics told ABC News today. A preliminary August survey released on Friday showed Chinese manufacturing activity fell to a six-year low, which may mean lower demand for American goods, noted fellow Moody's Analytics economist Ben Garber. Substantial declines in Chinese stocks once again fueled sell-offs around the globe. Earlier this month, China devalued its currency, the yuan, with the hope of spurring its own economy by making its goods cheaper and imported goods, like those from the U.S., more expensive. 2. Federal Reserve SkepticismThe Federal Reserve released minutes from a recent meeting and revealed that the hike in interest rates that many investors expected in September may not happen after all. The U.S. central bank hasn't raised interest rates in nearly a decade. With interest rates near zero in most economies, "If another recession comes, markets are worried that governments may not be able to respond as flexibly," Boston College economics professor Bob Murphy said last week. Lindsey Piegza, chief economist with Stifel, Nicolaus and Company, said a large portion of the decline in stocks is an acknowledgment that the U.S. economy is fundamentally not strong enough to withstand a rising rate environment. Some economists are concerned that a hike in interest rates and a subsequent increase in mortgage rates could lead to a fall in housing prices and jobs slowdown. 3. GreeceGreek Prime Minister Alexis Tspiras announced his resignation on Thursday after less than a year in office and called for new elections as the country receives debt relief. "New elections might solidify this support, but in the near term will increase uncertainty about whether the Greek crisis re-emerges this fall," Murphy said. 4. More Global ConcernsElsewhere in the world, Kazakhstan's currency lost a quarter of its value on Thursday as it switched to a floating exchange rate. "Though this country's performance does not threaten the global economy by itself, it speaks to further upward pressure on the dollar and concerns about the negative impact of a potential Federal Reserve rate hike," Moody's Garber said. 5. Oil LowsThe price of oil is now testing six-year lows. On Friday, the price of U.S. crude oil slid below $40 a barrel for the first time since 2009. Garber said the decline of oil prices and of other commodities signal fading emerging market growth prospects, ensuring "continued poor results for firms in the energy and mining sectors." Editor's note: This is an update of a report initially published on Friday, Aug. 21.